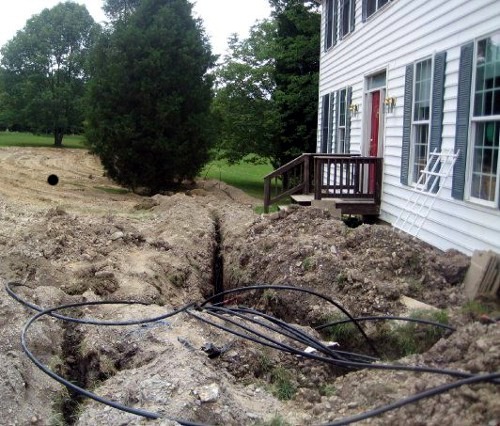 The earth loop moves heat between the geothermal heat pump and the earth. It has 3 basic parts: the fluid that carries heat, the pipe the fluid moves through, and the pump(s) that pushes the fluid through the pipe. The type of loop used depends on how much land is available, its features (for example: existing wells, bodies of water, rock or soil types), and the local costs for each type of installation (vertical bore drilling costs vary throughout the USA and the world; horizontal trenching can be from easy to next-to-impossible, depending on the soil substrate). Most loops that are installed today are closed loops. A closed earth loop's size (and design) are based on the size of the geothermal heat pump it will be coupled to, the type of soil it will be buried in, local climate, and the depth it will be buried to.